Dave Duell, "This was one of the most history-making weeks of my life. With their enthusiasm and zeal and the right message, these people can change Brazil and the world." Ton Sampaio, Brazil Conference leader and FMIN Partner, "We can change the history of this place with this message. On a scale of 1-10, I would rate these meetings with this team from the US and Australia at an 11!!" Dirk Bischel, Team member, to Bonnie, "Your teachings are like little sticks of dynamite that break up the fallow ground. If they were big sticks, they'd break the people." 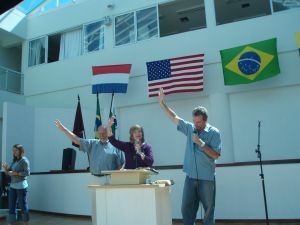 Son of pastor in Joao Pessoa meetings, "These are the best meetings we've ever had. This is the most ever I've learned in my life about who we are in Christ!" A pastor exclaimed, "We've never seen anything like this. We've never seen a team work together like this with so much power." Another pastor, "Please come again and again. It is an answer to prayer that this team came." Team member, "My life now has purpose. God brought a steady stream of broken-hearted people to me. My mantle has been awakened. I have a new confidence in working in the gifts, especially words of knowledge."